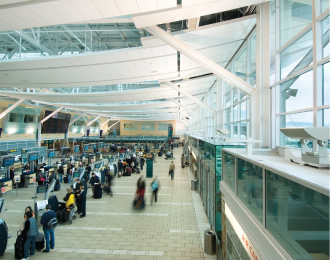 Vancouver International Airport uses Griswold Controls MVP&trade valves to improve heating and cooling comfort issues and reduce energy consumption. In the fall of 2005 Vancouver Airport Authority had a number of difficult and challenging problems to overcome. First, they were facing comfort issues in various areas of the Domestic Terminal, and they were not able to consistently achieve comfort set points. In addition, Airport Authority staff were seeing low ΔT – a system originally designed for 5.6º C (10º F) was operating at 3.3 to 4.4º C (6-8º F), thereby causing very high energy consumption. Lastly, during warm weather they had to operate more chillers than were necessary in order to achieve the desired temperature. MCW Engineering, Vancouver, B.C., the mechanical engineering consultant for the project worked closely with ESC Automation also of Vancouver, the controls contractor, and Riada Sales, the Griswold Controls sales representative, to resolve the issues. They came up with three basic objectives for a retrofit: reduce energy consumption, solve the comfort problems, and operate at a higher ΔT in order to allow the existing distribution piping to handle increased load from planned expansion. The system in place consisted of three 400 ton water-cooled chillers (one for back-up) and one 800 ton chiller. 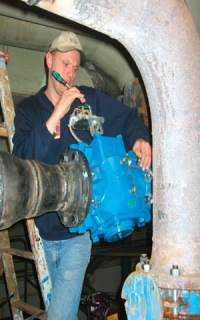 There was a constant flow primary – secondary design with three secondary pumps, pumped coils with both 3-way control valves and manual balance valves, three booster pumps that had been added to solve flow problems, and a check valve that had been installed in decoupler pipe to prevent recirculation of return water. Griswold Controls MVP™ valves solve comfort issues and reduce energy consumption at Vancouver International Airport. A key component of the retrofit involved installing new Griswold Controls MVP™ 2-way modulating pressure independent control valves on 25 air handling chilled water coils. In addition, Griswold Controls Unimizer® 2-way actuated control valves and wafer flow limiters were installed to form crossover bridges, operating three tertiary load zones serving 12 of the 25 air handlers. Griswold Controls flow limiters were installed on two heat exchangers serving perimeter induction units, and variable speed drives were added to the secondary and tertiary chilled water pumps. The last part of the plan was to bypass the coil pumps, remove the check valve from the decoupler and replace it with a bi-directional flow meter, and change the plant chilled water set point from 6° C (43° F) to 4.5° C (40° F). 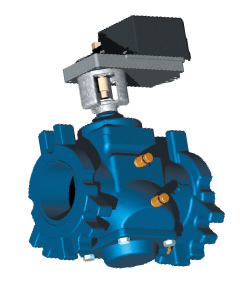 B.C., sets the flow on a Griswold Controls MVP™ pressure independent control valve. System commissioning took place in the spring of 2006 with ESC Automation reporting that the setup of the MVP valves went smoothly and took very little time. In the end, the chilled water ΔT increased to as much as 12° C (21° F) with peak flow rate reduced accordingly; all terminal areas were able to achieve comfort set points, with occupant complaints reduced; and in spite of some hot weather that summer they never had to run more than two chillers. An analysis of energy usage and costs forecasts annual savings of $40,000 Canadian dollars (approximately $39,512 USD) after the retrofit. 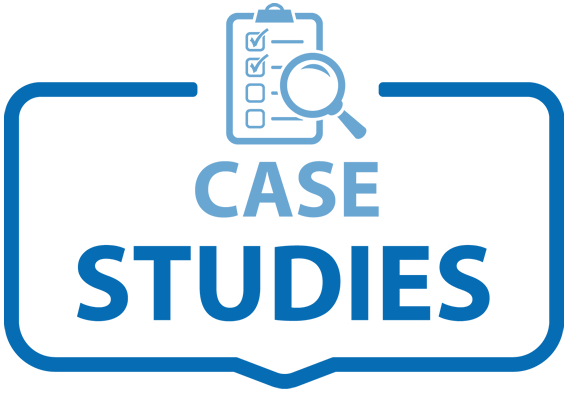 According to airport personnel, the Griswold Controls valves have been instrumental in the improvements achieved, primarily the MVP valves meeting the critical requirement of allowing the coils to deliver high ΔT, ensuring they reach their full potential. 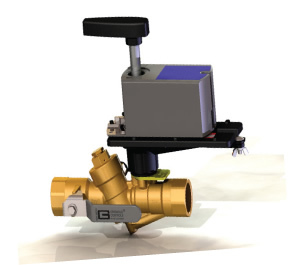 Griswold Controls’ MVP™ and PIC–V® are Pressure Independent Control Valves. Pressure independent valves dramatically reduce the energy costs, capital expenses, maintenance costs, performance issues, and capacity limitations associated with typical HVAC system pressure fluctuations. Pressure independent control valves are designed to replace the conventional 2-way control valve and balancing valve pair installed at heating and cooling coils in buildings. To obtain the most efficient and optimal results in a system, only the necessary amount, no more and no less, of chilled or heated water must be delivered to the heating and cooling coils at all times. This saves energy, increases available plant capacity, minimizes capital expenses necessary to acquire additional capacity, and simplifies system design and control. Every year billions of dollars are wasted due to the weaknesses in HVAC heating and cooling systems. If heating and cooling systems do not consistently operate at their designed temperature differential, energy waste occurs and money is needlessly thrown away. This unnecessary expense can be eliminated by using Griswold Controls’ pressure independent valves. Pressure independent valves stabilize flow. With stable flows, the designed heat transfer is maintained. The result is energy savings because less flow is required to achieve the same heat transfer. When conventional 2-way valves are used to control the flow of water through coils various actions, such as adjusting a valve or changing the pump speed, affect pressure in the distribution system. These actions in turn affect the flow through a two-way valve even if the load does not change, and may in turn change the temperature in the space. The thermostat responds and the valve modulates to bring the flow back to what is required to meet the load. Until the flow is corrected, the coil operates at an off-design point and will over – or under – condition the space. With a pressure independent valve design set point deviation will not happen. The valve responds only to a signal from a thermostat indicating the load has changed. A pressure independent valve will not feel the operation of other equipment on the system. By responding only to the change in load, the pressure independent valve is self–balancing, it delivers the proper amount of flow to meet the requirements of the load regardless of the state of other components in the system. By stabilizing heating and cooling coil flow in spite of pressure variations, more space can be heated and cooled with less equipment and less energy, and the entire HVAC system is always in a state of constant flow balance. Griswold Controls’ MVP and PIC–V pressure independent control valves ensure that all HVAC systems achieve steady flow and high ΔT at all loads, guaranteeing stable temperature control and better heat transfer. This ultimately results in lower energy costs and lower flow requirements for proper heat transfer.